Nutrition is a very personal subject and requires a lot of experimentation out on the open road in various conditions. Those conditions should include heat, cold, hilly, flat terrain, high altitude or sea level. It should be a good representation of your typical race conditions. You need to experiment with different intensity levels and different durations. For example, something that taste good at hour one may not taste so great at hour five of your bike leg in an Ironman or an Ultra event. I have found that different intensity levels require different nutrition protocols. For me I like and perform better with less solid foods at higher intensities. The longer the duration my intensity is more moderate and I supplement my liquid nutrition with solid foods. For me the breakpoint at which I seek more solid foods is somewhere over 200 miles. You should experiment and may I suggest that you document how you felt on your ride–if you are serious about your training and want to follow your progression. You should have a training diary/journal where you log, at a minimum, your nutrition, climatic conditions, duration and intensity (perceived or actual from a power meter) of your ride. Here are things that work for me. I really like Sportquest products. I have a product sponsorship from them but I chose them out of the many nutrition suppliers available. Carbo-Pro powder is very easy on your stomach. It is pure carbohydrates but without SUGAR. Carbo-Pro is a Maltodextrin. It does not contain electrolytes, fat or protein. You supplement your electrolytes through the use of Vantage VO2 capsules. Here is an important distinction from the many products containing electrolytes. You now have the flexibility of moderating the electrolytes required for the conditions. You may increase your electrolytes without increasing your fluid intake which may lead to bloating and subsequently poor performance. I personally use Motor Tabs tablets for my no hassle electrolytes and to add a little flavor. Each tablet contains 250mg of Sodium and 75mg of Potassium and 65 calories. So here is my mix– TWO SCOOPS OF CARBO-PRO POWDER AND ONE MOTOR TAB TABLET. 290 calories 250 mg of Sodium and 75 mg of Potassium. You will often see me using Carbo Pro 1200 which is a liquid concentrate in a 16oz bottle. Each bottle is 1200 calories. CP1200 has Sodium and Potassium which I have found even in 100F (see last weekend’s post) is enough to stave away cramping. the flavor is very light considering the concentrated formula. These are just three products I use from a full range of nutrition products that Sportquest offers. 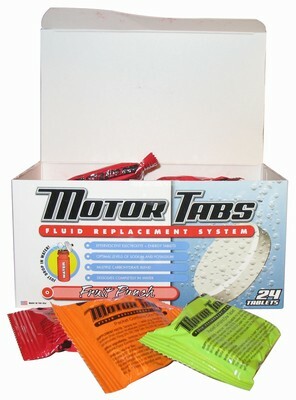 The Motor Tabs tablets offer a convenient and portable way to supplement your electrolytes. I would say if you still haven’t found your favorite or “secret potion” give Sportquest Carbo Pro powder a try. It is the easiest product on the stomach that I have found. If you start Carbo Pro you have a solid foundation from which to build on. You will discover that you can perform at your best from the beginning to the end of your training or racing event without stomach upset or GI issues. If you have any questions please drop me a line directly. This entry was posted in nutrition by REV Cycling Directeur Sportif. Bookmark the permalink.